Every morning, the fine folks at Sports Radio Interviews sift through the a.m. drive-time chatter to bring you the best interviews with coaches, players, and personalities across the sports landscape. Today: Regrets, Pryor's had a few. Terrelle Pryor joined 97.3 the Fan in Pittsburgh with Seibel, Starkey and Miller to discuss preparing for his first game on Sunday as an Oakland Raider after his suspension was lifted, being open to the idea of running the wildcat formation as a wide receiver, following Ohio State University football this season, the one thing he wishes he could do over during his college career and getting the chance to meet Al Davis before he passed away last Saturday. Your suspension is over. 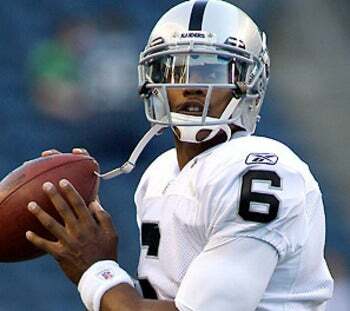 I'd imagine there is a learning curve, but what are the Raiders doing with you to get you prepared for Sunday's game? "We're just trying to go get ready and practice. That's what I am looking forward to being with my teammates. I see how hard they work and I am just waiting for an opportunity to practice with them and get some reps in and that's it. Just working hard with them guys." Do you have the mindset that you will do anything to be on this team? Will you even play at wide receiver on some packages if it means you'll stay on the roster? "They are not going to do that. It is what it is. Right now I'm at a quarterback position and they may have some wildcat packages or whatever the case may be. I will be at quarterback and I will be a very effective one." Are you following Ohio State University football? What do you think when you watch them? "In a way it hurts me. I know I should be on the field helping them guys for the mistakes that I have made, but I am not perfect. No one is perfect. I never met anyone that has been perfect and I always say when I do meet that person that is perfect I am going to learn from that guy, but until that day I am learning from my mistakes and I am going to take it as a man. Right now it saddens me. I get sad sometimes watching the guys because I know I can be on the field helping them guys, but I can't think about that right now. I am on the next page and trying to take care of business. I hope all the success for them guys and I pray for them and hope they turn some things around." Is there one thing in your college career that stands out that you wish you could do over? "There's a lot of things we wish we could have back. It's just like me throwing an interception and I'm on the sidelines thinking, ‘Dang I wish I got that play back!' But the play is over. You can't have the next day back, so just to answer your question I don't really think like that. I think god put me in this position to be where I am at right now. I can't be in a better place learning from Jason Campbell and having one of the best coaches in my opinion that I have ever had in Hue Jackson. I learned a lot from him and I just feel god put me in this position and this is where I am going to be successful at in Raiders Nation." Did you get a chance to meet Al Davis and what was that like? "I talked to him a couple of times a week. Once a week at least. It was just talking to a legend like that. Him just passing away…it sucked. I couldn't believe it. I was in disbelief. I didn't know the guy that long, but just from talking to him and how passionate he is it is amazing just talking to him on the phone. You just get lightning. You just get a buzz and butterflies in your stomach because he just talks about winning. He's so passionate about the game and so passionate about Oakland. It amazed me and my heart goes out to his family and he was a great guy." • Ruben Amaro doesn't know why Ryan Howard was swinging 3-0 either. • Barkley: players need to accept a 50-50 proposal if they want to play basketball this year. • Joe Girardi has lots of manlove for Jorge Posada.